The SRX101A tabletop processor offers variable speeds which can be set from within the processor. This allows you to choose the optimum cycle speed to match your processing needs. Konica Minolta’s 90 second cycle allows fast developing of all super rapid processable films. 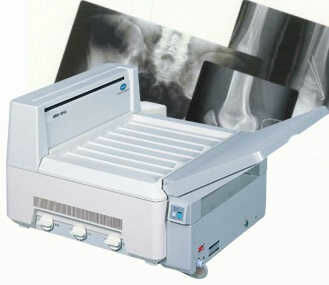 The Konica Minolta SRX 101A processor produces high quality radiographs with easy operation and is the ideal choice for imaging sites, diagnostic centers and private practice offices. The SRX-101A processor is perfect for reliable low volume applications, especially where space is at a premium. The compact design of the SRX-101A saves valuable space and incorporates an automatic standby with jog cycle for conserving water and energy. State-of-the-art technology stabilizes developer and dryer temperatures. It also offers automatic replenishment. Control Panel: Depending on your space requirements, the control panel can be situated on either side of the processor. The SRX- 101A plugs into any dedicated 110V outlet so that no special wiring is needed. Feed Tray: A 17-inch wi de film transport system provides faster film feed for larger radiographs, or two 8"x10" films - or smaller can be processed side-by-side. Up to 75 10"x12" or 60 14"x17" films can be processed per hour at the 90 second processing cycle. Innovative Design: An innovative rack design and smooth plastic tanks make periodic cleaning remarkably easy and simplifies routine maintenance. Incorporates a quiet operating infrared drying system for consistent drying of radiographs, and a light tight feed tray cover permits the operator to leave the darkroom during the film feed.